Wisteria, a group of vines in the pea family, are climbing vines that can resemble weeping trees when they twine around posts, stumps or woody plants. These fast-growing vines produce long clusters of purple or white flowers resembling bunches of grapes. Several types of wisteria will grow in Florida, including Japanese and Chinese wisteria as well as native species. Wisteria sinensis, also known as Chinese wisteria, is a twining deciduous vine that thrives in Florida. Native to China, it is considered an invasive species and should be planted carefully. This plant grows in shade or full sun, and thrives in USDA Hardiness zones 3 through 9. Over time, it can develop a thick trunk and tree-like shape, especially when properly pruned. 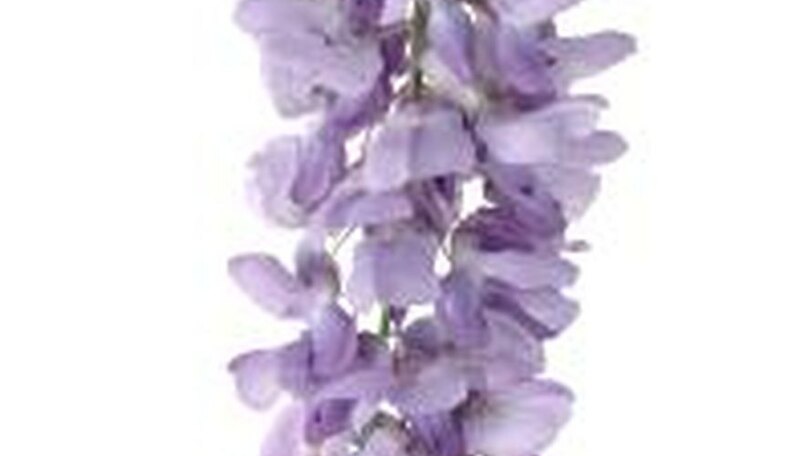 Chinese wisteria produces purple or white flowers. This plant, also called Wisteria venusta, originally native to Eastern Asia, can grow to 30 feet in length, according to NC State University. This plant, somewhat less winter-hardy than other wisteria, grows well only in zones 5 through 9. It prefers full sun, and most varieties produce large, white bunches of flowers. One variety, Violacea, produces purple blossoms. Japanese wisteria, or Wisteria floribunda, is originally native to Japan. It has spread extensively throughout the Southeastern United States and can hybridize with Chinese wisteria. According to the U.S. Department of Agriculture, this plant can be distinguished from Chinese wisteria by its twining direction. Japanese wisteria twines counterclockwise, while Chinese wisteria twines clockwise. The vine produces more leaflets than its Chinese relative and has blue-violet flowers that open in sequence, rather than all at once. Wisteria frutescens is also called America wisteria. It looks similar to cultivated Chinese and Japanese varieties but tends to bloom later and produce shorter flower clusters. This plant grows naturally in the Southeastern United States, including Florida. It tolerates partial shade but prefers full sun, blooming more with greater exposure to sunlight. American wisteria grows in USDA Hardiness zones 6 through 9 and is less aggressive than Chinese or Japanese wisteria. As a native plant, it makes a good choice in areas where the invasiveness of imported species is a concern. This North American native is also known as Wisteria macrostachya. It produces lilac to purple flowers in late spring and prefers a moist, well-drained site with plenty of sun. When mature, this wisteria reaches 25 feet in length. New vines may not bloom for up to 10 years, especially if over-fertilized or lacking in phosphorus.